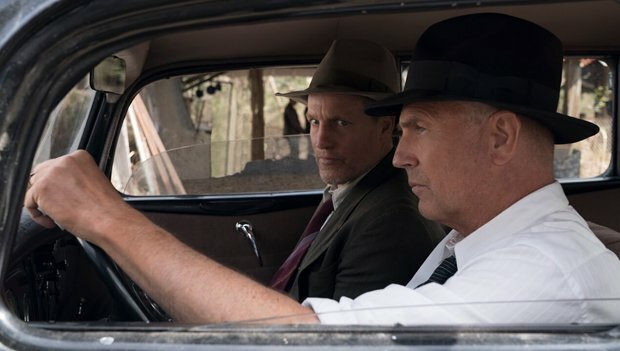 Kevin Costner and Woody Harrelson buddy up as real-life Texas Rangers in a film about taking down the infamous Bonnie and Clyde. It's based on the lives of Frank Hamer and Maney Gault, who were part of the posse who eventually caught up with the couple, and is told from the lawmen's point of view. Directed by John Lee Hancock (The Blind Side) and written by John Fusco (Young Guns), its straightforward approach to complex matters devolves into finger-wagging nonsense, where it feels like everyone is playing dress-up – even the fantastic Kim Dickens (Gone Girl, Deadwood), who is pitifully underused. We follow Hamer (Costner) and Gault (Harrelson) on a seemingly endless road trip across the states that builds very little momentum and fails to drum up a convincing bond between the men, making it difficult to take seriously. The Highwaymen sometimes aims for the sense of humour of something like Tough Guys, which brought together acting legends Kirk Douglas and Burt Lancaster as old-school gangsters released from prison in the lurid and confusing 1980s. So too are Hamer and Gault men out of their time: their wild and aggressive practices are outdated and their tracking techniques are called into question due to new wire-tapping technology. The jokes do occasionally land, particularly when it comes to discussion of their weary bodies, but such moments feel like small mercies in a tonally confused film. Harrelson boasts the more compelling perspective, as Gault reflects on violence and guilt, but it's not satisfyingly followed through. And Costner gets a couple of his own big moments, yet one of those manages to glorify guns and is grossly misjudged. And attempts to shame the press and public for their interest in real crime and fascination with the lovers on the run makes it a complete drag. Available to watch in selected cinemas and on Netflix from Fri 29 Mar.